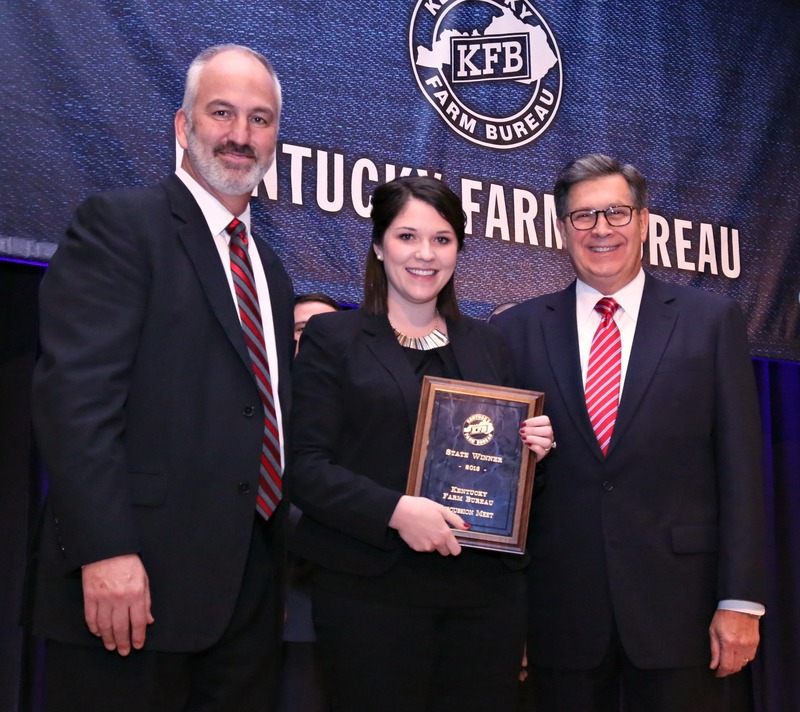 Louisville, KY (December 3, 2016) – Kirby Green of Daviess County won first place in the final round of Kentucky Farm Bureau (KFB) Discussion Meet, a debate-styled competition for young farmers that relies on an individual’s skill in reasoning and logical discussion of issues. The event was one of the highlighted activities of last night’s general session during KFB’s annual meeting in Louisville. Kirby Green accepts her first place award for the KFB Discussion Meet. Green bested three other entrants in the final event, winning a Kawasaki MULE donated by Southern Farm Bureau Life Insurance Company and Jacobi Sales. She also won a trip to the national finals in Phoenix, AZ, as part of the American Farm Bureau Federation’s annual convention, January 6-11, 2016. Winners of the national contest will have their choice of either a 2017 Chevrolet Silverado or a 2017 GMC Sierra, courtesy of General Motors, and a paid registration to the 2017 FUSION Conference in Pittsburgh, PA on February 10-13, 2017. Three national runners-up will receive a Case IH Farmall 55A, courtesy of Case IH, a $2,500 cash prize and $500 in STIHL merchandise, courtesy of STIHL. Runner-up in the state Discussion Meet was Kyle Kelly of Owen County, who received $1,000 cash from KFB. The two other finalists in the state-level contest were Lilly Robertson of Logan County and Kyle Skidmore of Bullitt County. They each received $200 cash awards from KFB.